I played baseball intensively from the time I was seven years old all the way through highschool. I've been getting nastalgic about it lately , so I did these pieces. The batter above is just entering the batting circle to warm up as he gives the current batter a motivational clap. That's what My old highschool uniform looked like. 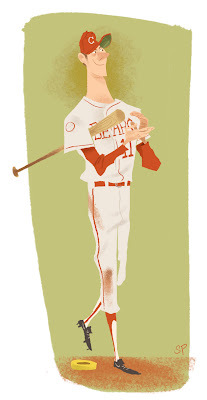 I gave this guy a 1960's Yankee uniform. Batters looked cooler without helmets. I love this moment just as the ball is leaving the pitchers hand, and even as the batter shifts his weight to antic he is still judging to see if the pitch is going to be hitable. It all happens so fast. 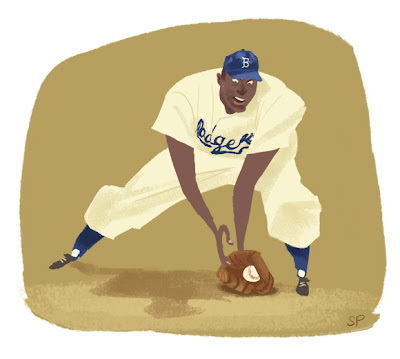 Jackie Robinson (above) had a great stockey build. He was springy but heavy. I always loved his 1960's Dodger uniform.